With Malaysia’s population ageing quickly, the question of who cares for our senior citizens is becoming increasingly important. Malaysia’s population is ageing at a faster rate than many may have realised. The average life expectancy for women and men in Malaysia is 76 and 73 years, respectively. This article considers the issue of caring for this large ageing population. There is a Chinese saying: store up grains against famine and rear sons for help in old age. In Asian culture, the responsibility of caring for elderly parents tends to fall on the shoulders of the children and their extended family. In fact, it was fairly common for childless couples or unmarried individuals to adopt a child so that they would have someone to care for them when they became old and frail. Unfortunately, these practices are no longer the norm in this modern era. As we become more educated and career-minded, having another family member to take care of while juggling a challenging job and bringing up a family is often perceived as an extra burden. Some say that caring for an elderly parent can be like taking care of a child. When parents do not have time to care for their own children in Malaysia, they hire a full-time maid to keep an eye on them; the same applies to elderly parents. In the geriatric ward, it is common to see patients of all races accompanied by a kakak – domestic workers hired from countries like Indonesia, Myanmar, Cambodia, etc, who act as the primary carer. They work around the clock, feeding, washing, dressing and accompanying the patients at all times. Some very dedicated ones even know how to clean and dress pressure ulcers or wounds, are able to help with the suction of phlegm, and do some simple physiotherapy or rehabilitation exercises with the patient. Alternatively, instead of hiring a maid, some parents choose to send their children to a nursery while they are at work, and pick them up after work. Similarly, in Western countries, there are “drop-in” centres where you can drop your parents off before you leave for work and bring them home when you finish work. This service is still not available in Malaysia, but instead, we can see rapidly rising numbers of nursing homes, especially in urban areas like Kuala Lumpur. In the past, parents usually moved in with their children as they grew older and became more dependent, and any children who sent their parents to an old folks’ home were regarded as having neglected their filial duties. However, taking care of an elderly parent has become increasingly difficult compared to 30 years ago. This is mainly because ageing now comes with a package of chronic diseases, like diabetes, hypertension, stroke, dementia and heart disease, among others. This is mostly a result of our unhealthy modern living habits, and also, the ability of modern medicine to prolong life, even with chronic disease. With most, if not all, family members in full-time employment, the elderly are often left alone at home during the day. With nobody at home to properly care for them, accidents, such as a fall, or incidents like a stroke or heart attack, could occur without anyone being aware of it. Any incident, even something minor, may contribute to a drastic decrease in the quality of life of an elderly patient, possibly resulting in them becoming fully dependent on others, completely bed-bound or unable to communicate at all. Therefore, while the ideal place to grow old is somewhere familiar with family around to keep you company, if the elderly parents spend their days at home alone, with no one to see if an accident occurs, then perhaps spending their days in a nursing home or old folks’ home may not be as disgraceful as it used to be. But it is important to remember that a nursing home is not somewhere you send your parents to and subsequently, wash your hands of all responsibility. All family members should still be actively involved in the caregiving process even if their parent is in an assisted-care facility. There is also a saying that when one grows old, one regresses and behaves like a child again. Consequently, people are often afraid of caring for the elderly, with even medical students and doctors afraid of being posted to the geriatric ward. What makes caring for a granny or grandpa seem like such a scary experience? Although we see the elderly as children, we do not really treat them as we would a child. For example, an 80-year-old grandmother was admitted to the geriatric ward due to worsening confusion. She could not stand being alone and was constantly shouting for the nursing staff to keep her company. She had behaved the same way at home and exhausted her family. She was prescribed with regular sedatives to keep her calm, as her family was unable to cope with her. It sounds reasonable, but would we sedate a child if he wanted us to pat him to sleep all the time or was always asking for company when put to bed? Both children and the elderly require a lot of time and patience, but our perspective on caring for them is different. Although we know the elderly behave like children, we still expect them to act like adults. We do not expect them to wet their bed, and we expect them to be able to listen and follow instructions, and remember whether or not they have eaten. And when they are unable to do all that, we lose our tempers easily. Perhaps a change in our perspective is what is needed. 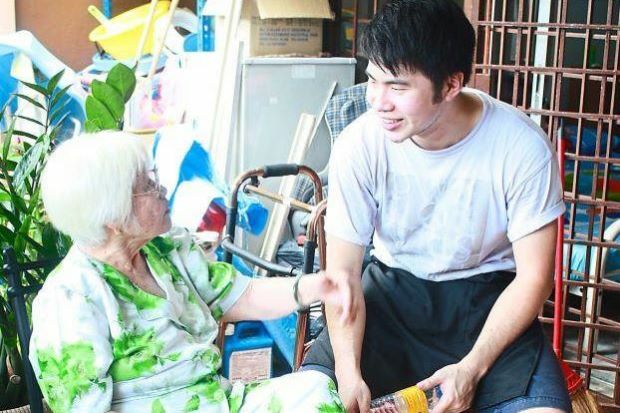 While caring for an elderly parent is no easy task, it was probably just as frustrating and difficult for them to bring us up. If they did not complain about bringing us up, then why should we complain about caring for them in their old age? Caregiving is not just about taking care of a person’s physical needs, but also providing emotional support through listening, counselling and companionship. And this support is most valued when it comes from family members. Previous : Doctors can’t treat obese man for elephantiasis until he loses 100kg. Next : Yearly, around 16,500 of Malay­sia’s 550,000 babies are afflicted with congenital abnormalities and about one third may succumb to these illnesses before reaching their first birthday.